The first day of autumn seemed an appropriate time to reprise my version of this popular comfort food, so I've condensed the three original posts into just one; but I hope you'll go back and read those first three posts. And, hey, if you take pity on me for the lack of response to those posts, do leave a comment on them as well as on this one. My recipe makes just the right amount of dough for two pizzas of the perfect size and thickness to together serve 4 or 5 people. And the three days in the refrigerator gives the rather wet dough the perfect texture as well as the most wonderful flavor. If there is a “secret” to it, I suppose it’s in the baking. I’ve tried all kinds of pizza pans, with decent results. But I was determined to find the ultimate pan or baking stone or whatever (short of having a wood-fired brick oven installed in my kitchen, that is). Not a huge fan of unwieldy pizza stones, I racked my brain till I came up with the perfect solution—cast iron. Searching for a 13- to 14-inch round cast iron griddle, I found that Lodge actually makes exactly what I had in mind and calls it the Lodge Pro Logic Cast-Iron 14-Inch Pizza Pan. Unfortunately, the recipes included with the pan did not make the best use of the pan. They called for using it as, well, just a pan. What I had in mind, on the other hand, was to use it as a pizza stone! Believe me, if you want to make “real” pizza at home without any other special equipment, you need to get this pan! On the day you plan to make the pizzas, remove the dough from the refrigerator 3 hours before you want the first one to go into the oven. Place a 14-inch-long piece of 12-inch-wide unbleached natural parchment paper on a peel or a rimless baking sheet--that's what I use for a peel--and dust lightly with flour. Place a second piece of parchment on the counter and dust lightly with flour. Place the two balls of dough on the two pieces of parchment and sprinkle them with flour; dust your hands with flour. 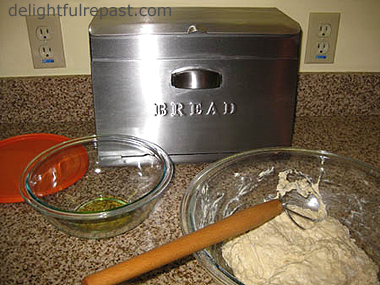 Gently press the dough into rounds about 9 inches in diameter; sprinkle with flour and cover loosely with oil-sprayed plastic wrap. Let rest for 2 3/4 hours. In the meantime, make your sauce. You only need about 2/3 cup of a fairly thick sauce for each pizza. My recipe makes just the right amount for two 13-inch pizzas. In 1-quart saucepan, heat oil and cook onion for a few minutes until soft. Stir in remaining ingredients. Simmer, loosely covered, for 1 hour, stirring occasionally. Let cool to room temperature. Sometimes I stir in an extra tablespoon of extra virgin olive oil at this point. Then get the cheeses and other toppings ready. I think where most home cooks go wrong with pizza is in using too much sauce and too much in the way of toppings. To avoid having a soggy pizza, use much less of everything than you think you need. Of course, you can use any toppings you like. These are just our favorites, and this gives you some idea of the quantities to be used--the more toppings, the less of each. 1 A half hour prior to baking time, place 14-inch round cast-iron pizza pan (or a pizza stone) in oven and preheat oven to 475 degrees for 30 minutes. 2 Make the pizzas one at a time, starting with the dough on the rimless baking sheet. With floured hands, press the dough into 13-inch round. (Actually, since the parchment is only 12 inches wide, it will be a little out-of-round, but not noticeably so.) If the dough keeps springing back, let it rest for 5 minutes so the gluten can relax, and try again. 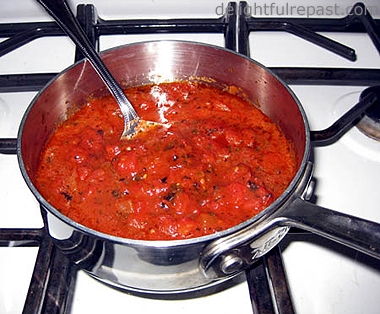 Let stand 10 minutes before saucing and topping. 3 Leaving the edge clear, lightly top it with room-temperature sauce and then with toppings. 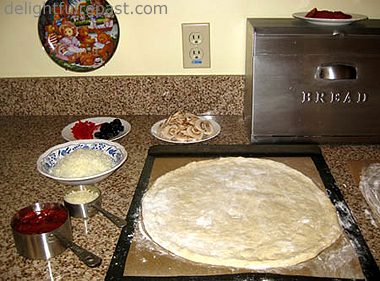 4 Slide the pizza (on the parchment) onto the hot cast-iron pan (or pizza stone) in the oven and close the door. Bake for about 15 minutes. After first pizza has been baking for 5 minutes, move second crust to rimless baking sheet and press it out; let stand 10 minutes before saucing and topping. 5 Using the peel (or rimless baking sheet), remove the pizza from the oven and transfer to a wire cooling rack. Wait about 3 minutes before transferring to a cutting board for slicing and serving. Meanwhile, sauce and top second pizza and put it in oven. Makes two 13-inch medium-thick-crust pizzas. See my original Part Three post for my precision timeline for getting the two pizzas made and served in a timely fashion. Piizzzzaaa! Well, I may be one of those comments you had before – and I know I'm missing the point on the dough – but I consider my Papa Murphy's take-home-and-bake Thin Crust Delight an original work on account of the mucho pile-ons that I had before cooking it just enough to make it into what I call a Slush Pizza. Said ingredients that I add include mega-size helpings of mozzarella, thick pepperoni, green peppers, black olives, sweet chili peppers, shiitake shrooms, Canadian bacon, Italian sausage, sometimes some cheddar, and pecans slightly burnt. Sully, you (yes YOU) could soooo make this crust. It would make you famous in Norby Nation and beyond. Love your add-ons, have used them all at various times, with the notable exception of pecans. I would never have thought to put pecans on a pizza! I congratulate you! What a beautiful sounding recipe - I do have a pizza stone myself and they can give fantastic results but they're definitely not the easiest things to handle around the kitchen. Your alternative sounds great. The final product? Well... any decent pizzeria would be proud I'm sure! Looks delicious! Thank you so much, Charles! I thought I'd stand a much better chance of not smashing my toes and cracking the tile floor with the pan than a stone! Love making homemade pizza!! Especially when I can through it on the grill :) I haven't no perfected my dough yet, though.. will definitely be trying your recipe next time! Thanks, Jenn. Hope you'll like it! I've never done it on the grill--we have a very tiny rectangular grill. I'll have to do it at a friend's house. That pizza pan sounds like an excellent addition to the pizza kitchen! I wonder if we can get one delivered to Australia. I'm gonna check that out. Your sauce sounds delicious too! Keep these great recipes coming. Thanks, Grant! Was just thinking how nice it would be to have some leftover pizza for breakfast right now! 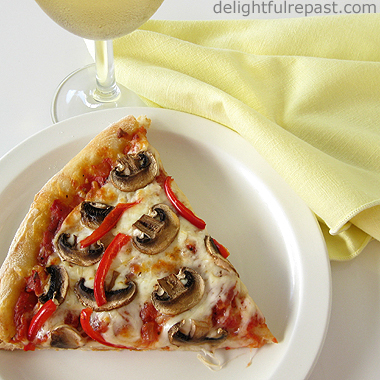 That slice is quite tempting! I adore homemade pizza; living in NYC has spoiled me with great slices available almost everywhere. Ashley, thanks! Just one of the advantages of NYC! Thanks for (re)sharing your pizza recipe. I'll have to give it a go next time I'm in the mood! A good American company (for the most part - I think they import their enameled cast iron from China)! I know what you mean about "in the mood." If you do try it, let me know how it worked for you. Thank you (!!!) for sharing your wonderful recipe and instructions. I recently found a brand new Lodge cast iron pizza "pan" at a Goodwill store (yes really! ), and had no choice but to buy it. We are a Lodge cast iron household, but that particular piece was new to me. I read through several very different sets of instructions, from a Google search for "cast iron pizza recipe". Yours was the most intriguing. I had my doubts about the dough at first because it seemed so runny. But sure enough, after 3 days in the refrigerator, it was just right. The sauce recipe is really really good. I made one pizza with the same amounts of everything that you recommended. The second one, with about twice the sauce and maybe 50% more toppings, won out though. We will definitely use your recipe again, but with more sauce and toppings (like our second one). The crust was perfect and crisp, even with more sauce, perhaps because we also followed your very helpful instructions for getting rid of excess moisture in the toppings. I am now in the wonderful world of cast iron pizza. Thanks for being there to help me along. Laura, thank you soooo much! You just made my day! I'm so happy you found the pan at the Goodwill -- it was pretty pricey when I bought it -- and that the recipe worked out well for you! Everyone I make it for loves it, but it's really gratifying to hear this from a reader. Thank you for taking the time to write a comment. Much appreciated.